After tasting this, someone wanted to label it An Ode to Rosemary (to each their own PR...). For me it's even more: a memory of home, an essential staple on the Christmas table, the aromatic reliability of flavors and affection. 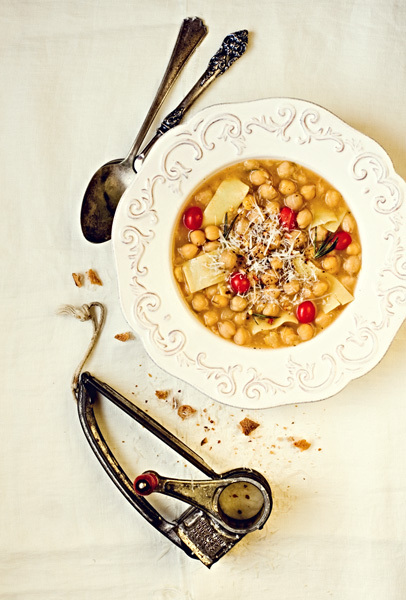 One of those recipes that doesn't hide anything, and we like it this way, naked, simple, and without any makeup: a little pasta, and lots and lots of chickpeas. Put chickpeas in a large bowl, cover with water and allow to soak overnight. Drain, put them in a pot, cover with more water and bring to boil. Cook slowly until tender, skimming occasionally and adding more water if necessary (it will take about 2 hours). When chickpeas are done, add garlic cloves, peeled and cut in half, bouillon cube, salt, pepper, a little olive oil, the herbs tied together with twine, and cherry tomatoes. Let simmer for another half hour, then add pasta, broken in small pieces, and cook until al dente. Discard the herbs and serve, sprinkling each plate with a little bit of grated parmigiano cheese and chili pepper to taste.